Saint Andrew, one of the disciples, is the patron saint of Scotland. Cross of St Andrew - the Saltire, and the Red Dragon Rampant flags. Pictures of Scots in full tartan etc. Fundraising volunteers should wear Scottish football and rugby shirts. Or kilts and other tartan bits and pieces. Start the day just right by offering a Full Scottish Breakfast. This might be at your local hall, school dining area, works canteen, local pub etc. Invite people along to start the day in style with a fantastic breakfast. Lovely Scottish porridge made with cream, drizzled with heather honey. The Full McMonty (why should the English have the monopoly on a great breakfast fry up?) Bacon, eggs, sausages, black (should that be Mac!) pudding, baked beans, tomatoes and mushrooms. Followed by toast and Scottish marmalade. All washed down with a few cups of tea. Haggis the very stuff Scotland is made of. Find a venue where you could turn out this classic Scottish meal. 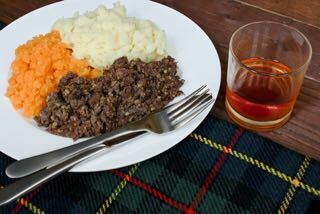 With lovely spicy haggis, "neeps" (turnips) and "tatties" (potatoes). For those not keen on hagggis how about Best Scottish Beef, roast potatoes, parsnips, carrots and peas with a beautiful thick gravy. For afters its got to be beautiful Scottish raspberries and cream. As the cooking for this is a bit more involved you may like to team up with a local pub, bar or restaurant. You organise the event, publicise it and sell tickets. They provide the venue and the catering for an agreed split of the profits. For them this is a great marketing opportunity. They will love the publicity, and having their place full of potential new customers. Tea with Dundee cake and Scottish shortbread. Offer slices of Dundee cake and shortbread around the office or workplace at morning coffee or afternoon tea-break, in return for a donation. This is one of those ideas for fundraising that is easily overlooked but can bring in a surprising amount of cash. Quick little fundraisers like this are easy to do and popular. As well as the money raised they are also a great opportunity to promote your organisation or good cause. No problem have a selection of whisky cocktails or rename some popular ones with Scottish titles for the evening. Always popular, particularly with the older generation. 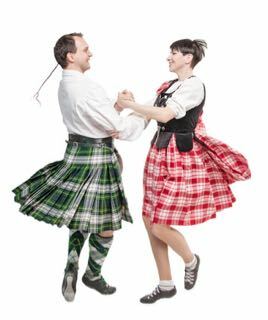 Book a venue for a Scottish themed meal with dancing afterwards. This might be a display of Scottish Dancing by a local group or a night where everyone has a go. You will need a band and a caller to explain the dances and shout out instructions. 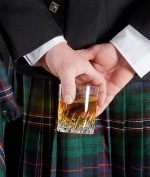 Ladies could you persuade any of the boys in your office or workplace to wear a kilt for the day. You'd be amazed at how much cash you can collect from a gaggle of frenzied office girls desperate to ogle the kilt-wearing office hunk! If you get a few of the boys involved, how about a highland fashion parade at lunchtime. What does the modern Scotsman wear under his kilt? Well ladies if you put enough money in the bucket you're gonna find out. Tradition says nothing at all (which is surprising considering the number of thistles in Scotland!). Hope that's given you some ideas for fundraising on St Andrew's Day. Don't forget if you come up with a great St Andrew's day fundraiser we'd love to hear about it whether its a major event or a tea-break ten minuter.